Venezuelan dictator Nicolás Maduro launched large-scale military exercises over the weekend, boasting in over a dozen posts on his Twitter accounts of how his “highly trained” soldiers held “impeccable demonstrations,” proving the country is “impregnable” from any foreign threat. Maduro nominally called the exercises to celebrate the bicentennial of when independence leader Simón Bolivar convened the Congress of Angostura, marking the eventual independence of Venezuela and Colombia from colonial rule. However, they were primarily intended as a show of strength against the United States, which Maduro insists is planning a military invasion of the country by secretly hiding military assets in trucks of food and medicine. As well as recognizing and providing political support to Guaidó, Washington has also placed fresh sanctions on the country’s vital state-run oil industry, a move designed to further drain the regime’s financial resources. Maduro still retains the crucial backing of the country’s military top brass, who control the repressive apparatus designed to protect the regime’s authority and crush political dissidents by force. 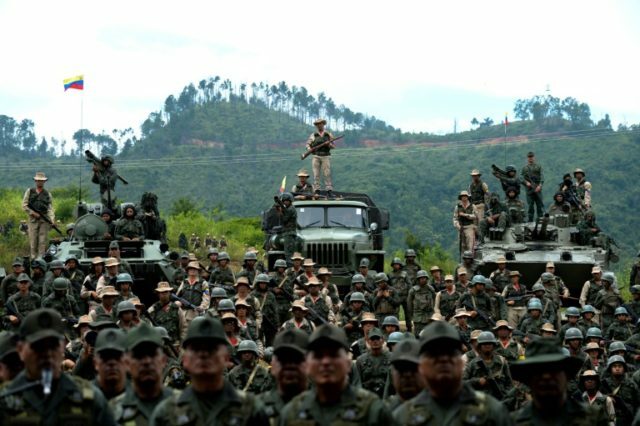 Maduro’s supporters and far-left radicals in the United States have speculated since Guaidó’s inauguration that the U.S. may stage a military intervention in the Latin American country, an option Trump himself has repeatedly maintained remains “on the table.” The State Department has repeatedly dismissed the possibility of using the military a a first resort against Maduro and, as noted by Andres Oppenheimer of the Miami Herald, “some U.S. analysts have estimated that invading Venezuela would take more than 100,000 U.S. troops.” Therefore, such a large operation is likely to attract fierce opposition both at domestically and internationally and from all sides of the political spectrum. Maduro has long maintained that the U.S. is planning to invade the country with the aim of ending his “Bolivarian Revolution.” In December, he warned American soldiers that they “will not make it out alive” if they invade the territory. “You must be ready to go to the heart of the enemy who dares touch Venezuelan soil – to go to the heart of the enemy and to tear out his heart in his own territory,” he declared at a military event in Caracas.